Another term, yet so many possibilities! This term we focus our attention on Sustainability, with the big idea of Feed the World. We want to know how we can M.A.D (Make A Difference) to others through leadership, raising awareness and helping others. 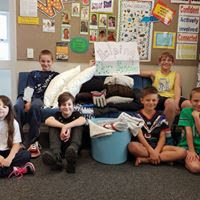 Already we have started collecting blankets, towels and sleeping bags for the homeless people in Auckland . . . well done Waitoki! Later on in the term we are going to be doing a canned food drive for those people in need. This will be run by the student leaders with points for each can donated gaining points for their individual houses. This week we started our Electives. We chose from coding, snowboard, glass work, clay modelling, cooking, milk bottle art, mountain biking, wooden wonders and many more. What fun! The coding team were fantastic, demonstrating great GRIT when the patterns and sequences got tricky. We used Lightbot which proved challenging but fun!